Doctor O has released photos of Bushiroad's Japanese release schedule leading through September 2013, and with it unveiled VG-BT13: Catastrophic Outbreak (絶禍繚乱 "Profusion of Absolute Evil," "Profusion of Absolute Misfortune" et al.) 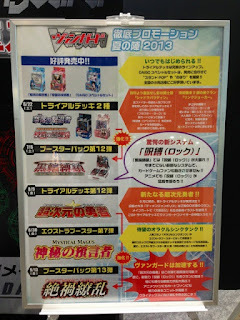 a booster set currently known to reinforce the Dimension Police, introducing new Dimensional Robo units while also bringing the new "Lock" mechanic from TD11 and BT12 to clans that have yet to receive it. BT13 is being touted as a "climax set," inviting comparison to BT05 and BT09 from previous seasons; however, it is currently believed based on previous panel comments from Bushiroad CEO Kidani Takaaki that the third season of Cardfight!! Vanguard, Link Joker, will be airing for over a year, so the use of the term "climax" for BT13 may be looser here. While the specific remaining clans of the set are not yet revealed, Link Joker has already been implied by the expansion of the Lock mechanic and set colors, and it is known that BT13 will be released on September 9th, 2013.